The Terry Johnson’ sound, or as most in the business know him “Buzzy”, is a very recognizable ethereal mix of lush harmonies and beautifully orchestrated music. At Motown Records, as a writing & producing partner with Smokey Robinson, his music was recorded by The Miracles, winning him a BMI Award for “Baby Baby Don’t Cry” and a top 10 hit “Here I Go Again”. He also wrote and produced songs for such great artists as The Temptations, The Four Tops, The Supremes, Edwin Star, Martha Reeves, The Marvelettes and David Ruffin. Throughout his 60 years career as a writer, arranger, producer and performer, Terry has continued to be inspired and influenced by musical industry giants like Nat King Cole, Sammy Davis Jr., Sam Cooke, Lambert, Hendricks and Ross, Wes Montgomery, George Benson, Manhattan Transfer, Marvin Gaye, The Philly Sound, Barbara Streisand, Frank Sinatra, Barry Manilow, Burt Bacharach, Bionce’, Michael Jackson, Clive Davis, David Foster and Tony Bennett. 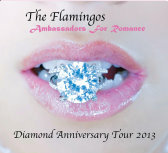 Staying true to the signature sound that he produced for The Flamingos with his Grammy Hall of Fame Award winning arrangement of ”I Only Have Eyes For You”, and the critically acclaimed album “Flamingo Serenade”, Terry has progressed The Flamingos’ legacy on this their ”Diamond Anniversary Tour” CD.